Either you are for or against The Modern Jazz Quartet, there is no middle ground. I am very much in the 'for' camp, and have always been a big fan of their chamber style jazz with its classical resonances. Yes, they can sometimes lapse into easy-listening mode; but that's a small price to pay for standards such as Django - see video below, the sound improves after one minute. Talking of small prices Avid Jazz have remastered and repackaged a quartet of classic early JMQ albums onto the super-budget priced double CD seen above. I paid just £5 ($7.80US) which must be the modern jazz bargain of the year, and there are similar priced double CDs of Sonny Rollins and Thelonious Monk. Don't be put off by the 1950s recording dates, the stereo sound and new transfers by Dave Bennett are excellent and put a lot of digital offerings to shame. And a bonus point for the artwork and booklet essay which would not be out of place on a a full-priced release. Jacques Loussier is one of many MJQ imitators. Loussier's Messe Lumieres was commissioned for the consecration of the new Cathedral of the Resurrection at Evry in France. If any reader can find me a recording of his elusive Messe Lumieres I would be absolutely delighted - read more here. Not to piss on anyone's bonfire (though I know I'm a week late for that), but I believe these European issues exist to sidestep copyright rules and profit without recourse to paying the artists or their estates, and thereby at their expense. Copyright on recorded performances applies for different periods in the US and the EEC. The Avid re-issues, and many others including Naxos Historical, do not 'sidestep copyright rules'. They conform to the letter of the copyright law applying in their country of origin. In some cases, such as Naxos Historical, they are not sold in the US because of the different copyright period. This blog has been an active defender of copyright protection for living musicians - http://www.overgrownpath.com/2005/11/musicians-jobs-before-free-downloads.html. But, copyright law notwithstanding, I find the case far less convincing when the recording is more than fifty years old, which the MJQ discs are. I am all in favour of money flowing in the right direction. But, in many cases, the majority of the money on these old recordings flows to lazy corporate record companies who neither made the original recording, nor take the trouble to actively repackage and remarket the recordings. If we give a damn we should be looking at YouTube. And yes, I have to plead guilty. That video I featured here yesterday - http://www.overgrownpath.com/2008/11/coming-to-concert-hall-near-you.html - is in breach of copyright laws both in the US and EEC. It makes unauthorised use of the audio track of a 2004 ECM CD made by musicians who are still alive and composed by a living artist. Citing RVG raises an interesting question: how many copies of a record need to be available at one time, especially when the “newer” versions don’t really offer any significant changes re: sound or tracks for your average listener and his/her audio system? Blue Note seems taken with reissuing its reissues these days. For example, see Coltrane’s Blue Train: http://www.amazon.com/s/ref=nb_ss_gw?url=search-alias%3Dpopular&field-keywords=blue+train; http://en.wikipedia.org/wiki/Blue_Train_(album). I’m all about alternates and enhanced sound, but why not approach it like Sony does for its fine Miles projects, adding significant value via packaging and aesthetics (like Jordi Savall’s amazing Francis Xavier package) to the newer additions? I realize that Blue Train is probably the only solo Trane record in the catalogue, but it’s a crown jewel. Compare it to Sony’s new Kind of Blue release: at least you’re getting more value (hardbound book, poster, photo, handwritten reproduction of Bill’s notes, etc.) for buying yet another copy of the record (along with the “new” outtakes and live tracks (that have been bootlegged previously)). http://www.milesdavis.com/latest_release.asp. Moreover, why have multiple versions of Blue Trane available simultaneously, when lesser-known, but equally outstanding gems like Gil Melle’s Complete 50s drop out of print ignominiously? http://www.amazon.com/Complete-Blue-Note-50s-Sessions/dp/B00000DCJY/ref=sr_1_1?ie=UTF8&s=music&qid=1226503207&sr=1-1. At least Bob’s MJQ find reflects a refreshing drop in price. 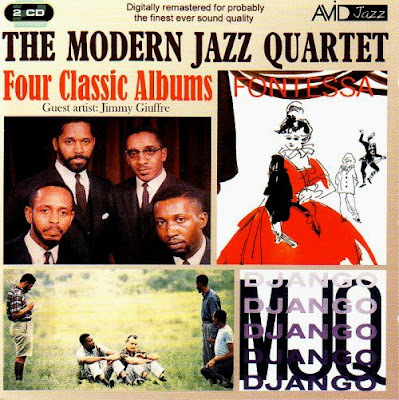 Thank you for the excellent recommendation on your blog of the Modern Jazz Quartet reissue. I ordered it not long after seeing your post about it and it arrived today. The quality is indeed excellent as a general matter, not just for a superbudget reissue.